Sarah Moss’s haunting new novel Ghost Wall looks at the evil that lurks behind the stories we tell ourselves about borders and ancestral origins. It’s hard to be a purist. Seventeen-year-old Silvie Hampton is haunted by this realization as she anxiously inhales a grocery-store popsicle before returning to the woods. In British writer Sarah Moss’s sixth and latest novel, Ghost Wall, Silvie and her family (father Bill and mother Alison) join Professor Slade and a handful of his students—the outspoken Molly and the forgettably boyish Pete and Dan—for over a week of “experimental” Iron Age reenactments on the moors of northeastern England. The group aims to live as prehistoric people did: Shapeless, handwoven tunics will be worn; food will be hunted and gathered; and precious objects will be sacrificed to the peat bogs that dot the terrain. But their desire to reproduce history is undercut by the temptation of late-20th-century amenities, and these amateur archaeologists have a habit of disguising their modern shortcuts as plausible historical acts. “A stew would be a whole lot easier than setting up a spit,” Silvie’s mom suggests, “and surely more authentic.” Another camper, in order to avoid eating grub from bare hands, urges the group to collectively imagine their early forebears using a prototype of the wooden spoons they’ve brought along. These prevarications seem innocuous at first, but they point to a central tension in the novel: between a contagious longing for the fictions of white ancestral purity and the actual impossibility of manifesting them. Early on, this tension is exacerbated—if not personified—by the differing visions of Professor Slade and Silvie’s father for the trip. Slade, though occasionally pompous, is a generally affable man who views this outing as little more than a professional obligation. Bill, conversely, is elated to escape the ills of modernity— he’s disgusted by television’s mind-rotting capabilities and women’s growing volition —and has forced Silvie and Alison to honor ancient sensibilities in lieu of more relaxing summer-holiday activities. This enthusiasm extends to his displays of misogyny and violence, aimed largely at his family when they fail to re-create the ways of ancient Britain with unflinching historical accuracy. Silvie, the object of familial brainwashing, has mostly inherited this thinking and obligingly parrots Bill’s reactionary ideas. It’s often disorienting to read her remarks—about the unthinking ways of stay-at-home moms or the Romans’ early “corruption” of the English—and recall that they’re being uttered by an otherwise charming teenage girl. Moss intensifies this feeling through unmarked dialogue: The flat presentation of bold statements mimics Silvie’s suspension between captive innocence and learned cruelty. And though less fixated than Bill on maintaining some ancestral myth, Silvie is nonetheless afflicted with the same general rigidity. To a fault, she accepts the consequences—nasty remarks or even lashings—that follow on her failure to cede to her father’s unsparing convictions about the past. Still, as Silvie ambles the moors in search of edible roots while staring in wonder at the topography— she fondly imagines “how a person might learn a landscape with her feet”—we witness the glimmer of a more generous worldview within her. What about Boadicea, Dad said, she routed them an’ all, didn’t she. Boudicca, said the Prof, we call her Boudicca these days, it seems to be a more accurate rendition. 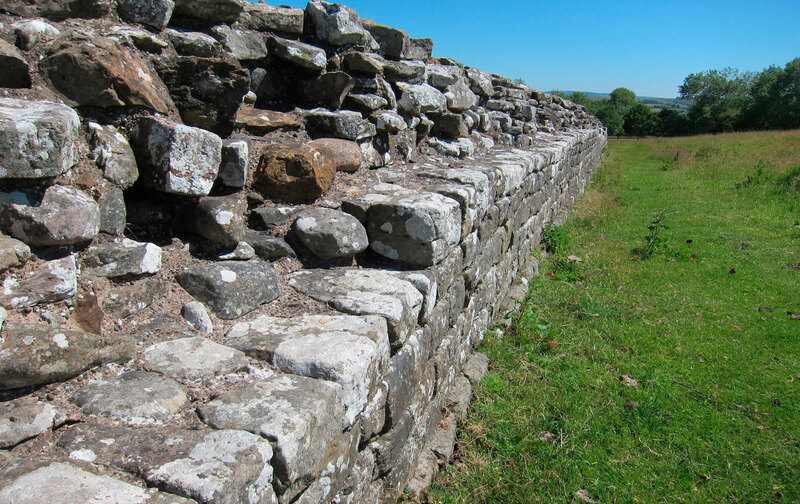 For a while, yes, but she led the Iceni in the south, there’s not much evidence that the people round here caused the Romans any major alarm, the Wall was much more of a symbol than a military necessity. The fortification in question here is Hadrian’s Wall, yet the underlying sentiment evokes any number of other barriers and borders in the darkness of the public imagination. To that end, Ghost Wall’s parabolic approach is a refreshing departure from the fashionable impulse in fiction to relegate political events to the status of inert objects. As the book’s title suggests, Moss instead renders them as ghostly presences. History thus acquires a spectral register: It lurks ominously on each moor and in every character, as if to remind us that the destructive human habits that have shaped the past are never that far off. If anything, the plot’s present dealings are subsumed by the past’s ugliness, and Moss builds narrative momentum by narrowing the gap between procedural reenactment and actualized ritual. “It went from being a bit daft to feeling like something real,” Silvie admits of one sacrificial performance, involving rabbit skulls on sticks. At times, the artful ingenuity with which Moss engages the questions of history and politics doesn’t lend itself to in-depth characterization. Silvie reaps some complexity by virtue of her status as narrator, but the other characters often seem to be merely the archetypal conduits for virtue-signaling. Alison’s downcast gaze, for example, becomes Bill’s perversely perfect invitation to indulge in knee-jerk displays of toxic masculinity. Molly, on the other hand, stripped “down to bright lace underwear” on a blistering summer day, slowly lures Silvie out of her sexless thinking, which has for so long been enforced by the threat of her puritanical father’s disgust. And while Moss usefully deploys these attributes to underpin the binary of good and evil, in keeping with the story’s allegorical register, Ghost Wall’s moral agenda comes at the price of overshadowing its far more subtle subplots. Mostly, though, the novel yields a powerful and satisfying indictment of Bill and the harmful bigotry he’s come to represent. Indeed, just as a ritual at the book’s end flirts with deadly consequences —innocent campers are lured to participate, and Silvie, with a flint blade “to [her] hairline,” is made the sufferer—Moss’s principles win out. Ghost Wall suggests that, while the dead may have no defense against the self-serving tales spun from a bloodied past, the living have an obligation to understanding and truth. That is, so long as one can spurn the murky tendencies that idle in the bog of the mind. Emma Hageris a writer in California. She’s written for The Millions, Elle, and elsewhere.